Personalized your "Great Lover Gift", Skinny Promise Women Rings can be customized for yourself or the great gift. This Custom Promise Ring comes in a gift box and also makes a wonderful engagement ring, wedding ring, mom ring,girlfriend ring,promise ring,bff rings,friendship ring,lover ring,family ring!. Are you looking for the best anniversary gift for your beloved? Are you sick and tired of cheaply made ring that would break after a while? Do you need the most thoughtful piece of jewelry to match your outfits? This engraved names women ring is your good choice. Made with a touch of luck and a lot of love, this beautiful women ring takes inspiration from the simulated birthstone. 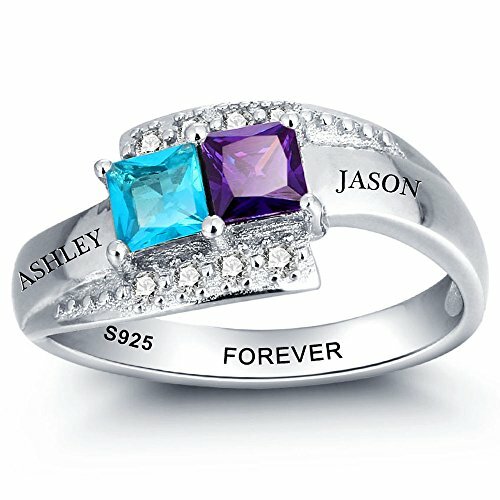 Engrave a special message on the base, and personalize it with simulated birthstones of the one we love to make this ring even more meaningful. Available in your choice of size, customizable simulated birthstones, the Precious Promise Ring is the best gift she'll never want to take off. Simulated Birthstone add charming and beauty. Wearing simulated birthstone jewelry can improve self-confidence and charming, bring happiness and good luck. A great gift for girlfriend,wife, daughter, mom or friends on Valentines Day, Mother's Day, Christmas Day, Birthday, Anniversary, Thanksgiving Day, etc. We Ship It From California to Worldwide. Hand Crafted with care! Lightweight design that is great for every day and evening wear. ✉✉✉ Any questions? Don't hesitate to contact us! Get Started by Choosing your desired ring size from the drop down menu. Then Click on "Customize Now" for personalization and checkout. Next, Type in two names or words and the colors of the corresponding months in the box and then proceed to checkout. A lovely gift for your wife, girlfriend, loved one or a special treat just for yourself. This 2 Heart Names Ring makes the perfect birthday gift or a unique gesture for any occasion; Wedding,Christmas, Valentines, Anniversary or just because. This ring arrives in an elegant gift box, ready for giving or receiving. If you have any question about this personalized names ring, or if you're not completely satisfied, please feel free to contact us. If you have any questions about this product by Diamondido, contact us by completing and submitting the form below. If you are looking for a specif part number, please include it with your message.